Welcome! I'm excited to be participating in this Around The World Blog Hop! Thanks so much for asking me to join, Caroline. I was fortunate to meet Caroline in person at last year at Spring Market in Portland. I have been following her on Flickr and IG before that. I have been a fan of her work for a long time. 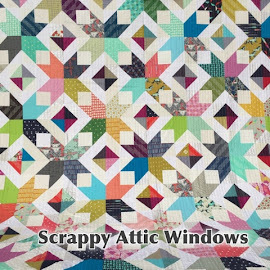 She's an amazing pattern designer, quilter and she knits too! I'm currently working on a quilt right now. This is a Michael Miller fabric challenge only for Sewtopia attendees. Amy sent 4 FQs of low volume prints. We are only allowed to use other Michael Miller fabrics for this challenge. I didn't realize I had so many fabrics in my stash that I could work with.... I'm actually kind of embarrassed.... Here's what I've done so far. I cut half square triangles (HST's) and added a strip down the middle. I used 5" squares I cut to make the HST's and the strips measured anywhere from 1.25" - 2". Then I squared them up to 5". I made some of them wonky just to change it up. Each block finishes at 4.5". Something that sets me apart is that my work is varied. You will not see one style from me. I work with traditional blocks as well as modern. Putting a modern spin on a traditional block makes me giddy. I love machine quilting as well as hand quilting especially with embroidery floss. I even do raw edge and needle turn appliqué. I love trying new techniques and applying them to new projects. I also love an overall scrappy look. 3. Why do I create / write what I do? I started sewing when I was in high school. Just for fun. Then I started sewing again after I became a mom for the first time. After I had my first child, my husband and I decided that I should stay home. After working for several years, staying at home was strange. I'm someone that's always doing something so I decided to sew again... Turns out I enjoyed it... ALOT! Then I discovered designer fabric.... 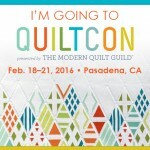 The Modern Quilt Guild.... new friends that provided so much inspiration = I was HOOKED and still am! 4. How does my writing / creating process work? I have a "just do it" attitude when it comes to my projects and my process. I took an improv class with Denyse Schmidt and it changed my creative process. The first thing she says is "Just Let Go. Who cares if this doesn't look good right now. It will all look great together at the end." There are so many times when I'm not crazy about a block I made. Instead of throwing it out, I keep it and continue making more. Once I'm done, I put everything together and it all looks great. 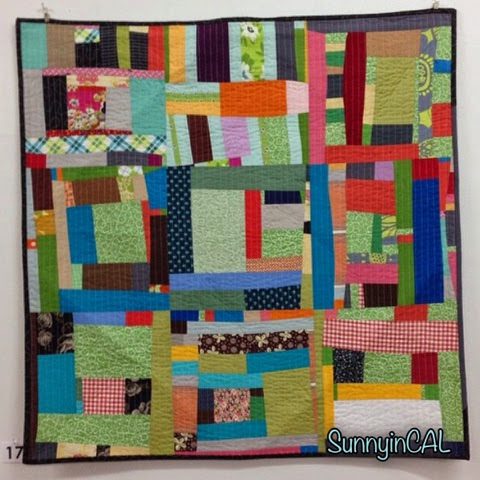 Here's the quilt that I made from here class. She was right. So that's it. Enough about me.. I would love for you to check out some of these ladies. They are all pretty amazing. Amy Morinaka - (is the author of Zakka Handmade: 24 Projects Sewn from Natural Fabrics to Help Organize, Adorn, and Simplify Your Life- She makes the prettiest things! I just adore everything she makes. Check out her feed on IG - (chickchicksewing) and you'll know what I'm talking about. 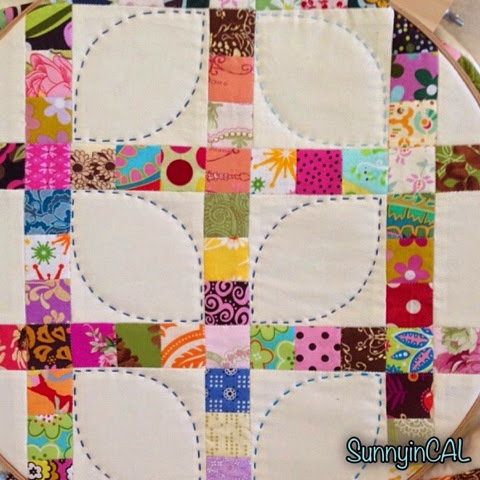 Bonnie Rosales - I love her simple patchwork. 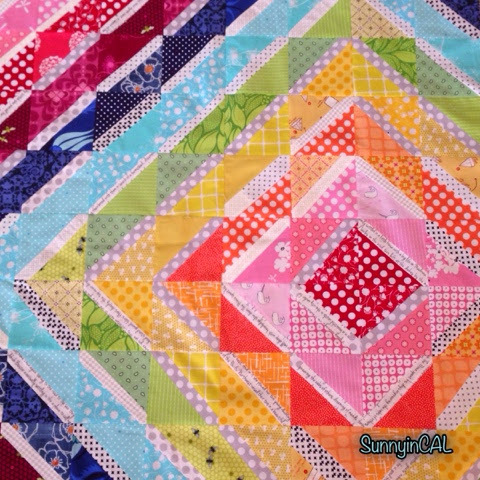 I have never made anything with simple patchwork, but I started to because of all the cute ones that Bonnie's made. I didn't like pink before, but it's starting to grow on me. All because of this lovely lady. She has a great Boxy Pouch Tutorial on her blog. She's greenletterday on IG. Jemellia Hilfiger - Have you ever met someone and just clicked right away. Kinda like you've been friends forever? That's how I feel about Jemellia! Talk about a "Just Do It" attitude..... She started a sewing studio called Je's Bend, she also co-founded Sew OK and now she's part of Sewtopia Chicago. Plus, he makes great garments and quilts too! She's jemellia on IG. I love how bright and fun your projects are! Such a great blend of modern and traditional influences!